Truth be told, I am rather sceptical of the “If it costs more, it works better” mantra, especially where beauty products are concerned. Given my experience with the Olays’ and Eucerins’ of the world, I can safely vouch that sometimes department store budget buys can outperform the priciest luxury formulation by leaps and bounds. 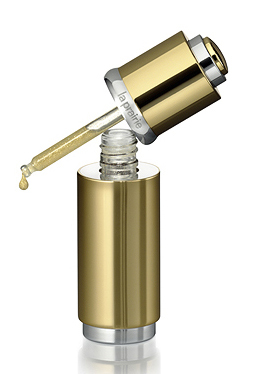 However, ever so often there comes a product that makes you believe in the power of research dollars once more – and the La Prairie Cellular Radiance Concentrate Pure Gold is a case in point. The concept is actually not “new” – the ancients considered gold a source of immortality. The Chinese believe gold possesses the power to heal. Modern medicine uses gold to treat a wide variety of conditions. In diverse civilizations, gold remains a symbol of wealth and luxury. Unfortunately though, till now, gold has remained on the fringes of the modern beauty revolution, with few companies knowing how to distill its fragile potency into a truly effective, off-the-shelf product. Hyaluronic Acid Microspheres fill in fine wrinkles and plump the skin within one hour of application, while providing long-term hydration. A new-generation Anti-Wrinkle Neuro-Peptide reduces the depth of wrinkles caused by the contraction of facial expression muscles, especially in the forehead and eye area. Emblica Fruit Extract is a key ingredient in a Mega Brightening and Lightening Complex, which regulates pigmentation and reduces age spots. These act in tandem with two exclusive La Prairie complexes: Radiance Complex, whose quartz, liquid crystals and reflective pigments disperse the light to subtly illuminate and brighten the skin; and Exclusive Cellular Complex, which nourishes and moisturizes the skin, in addition to stimulating its natural renewal process. Rounding out the uniquely effective formula are Rejuvenating Plant Extracts, including Soybean Sterols and Wild Yam Root Extract, which improve the skin’s vitality, elasticity and firmness and support it during periods of hormonal imbalance; Glycolic, Malic and Lactic Acids, in synergy with Sweet Almond Protein, which speed exfoliation without irritation; and a potent cocktail of powerful antioxidants, which protect the skin against damaging free radicals. That, one must admit, is quite a bit to pack into one bottle – even at US$580 a pop!